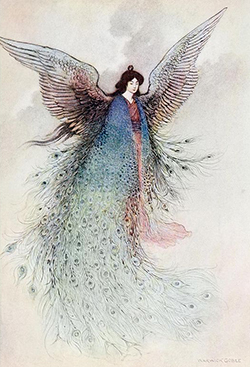 Illustration from the tale The Moon Maiden. Green Willow and Other Japanese Fairy Tales is a collection of 38 Japanese fairy tales authored by Grace James. As an author, Grace James was mostly known for her John and Mary books, which were a series of children’s books about two children who have fantastic adventures. The first John and Mary books were published in the 1930’s, and were popular with English schoolchildren. However, in 1910, before the John and Mary books, the author was a dedicated folklorist as well, collecting and retelling traditional Japanese folk tales with Green Willow and Other Japanese Fairy Tales.